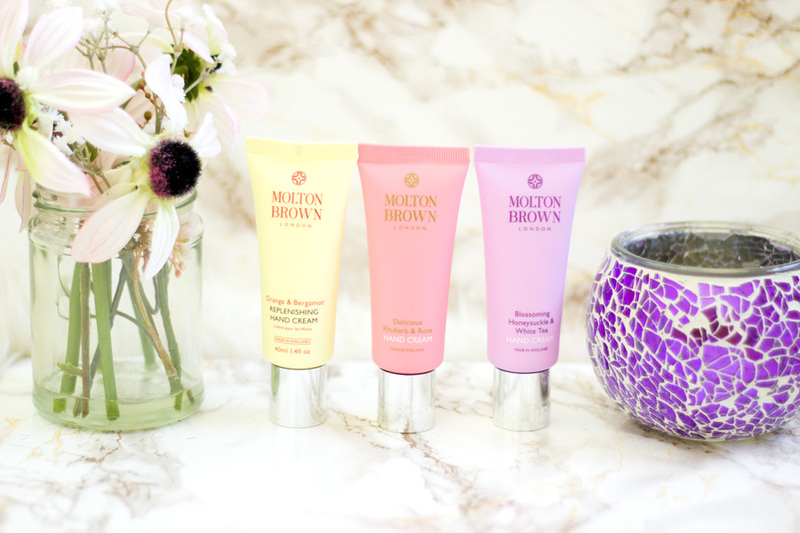 Molton Brown was co-founded by Caroline Burstein and Michael Collis about 40 years ago and it actually started out as a hair salon. 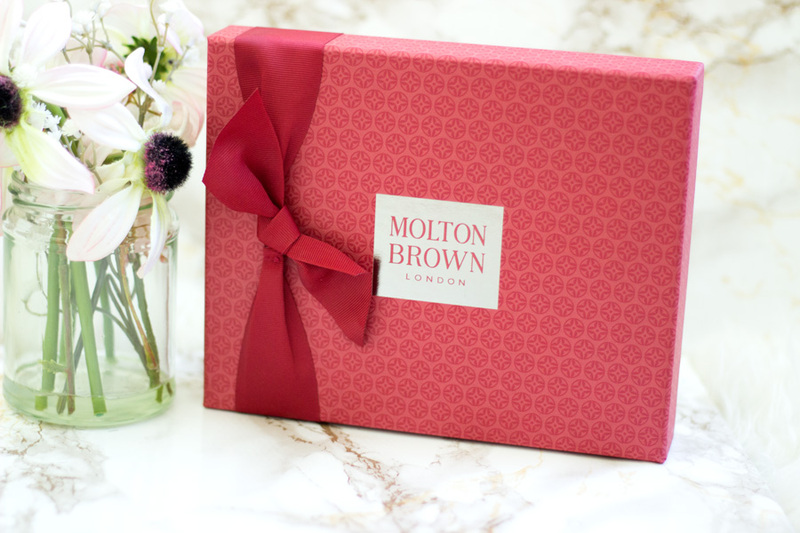 The name Molton Brown came about from the name of the first store's street location (South Molton Street) and Brown's Fashion Boutique (founded by Burstein's parents). I am always interested in how people founded their company, brand and even blog names. 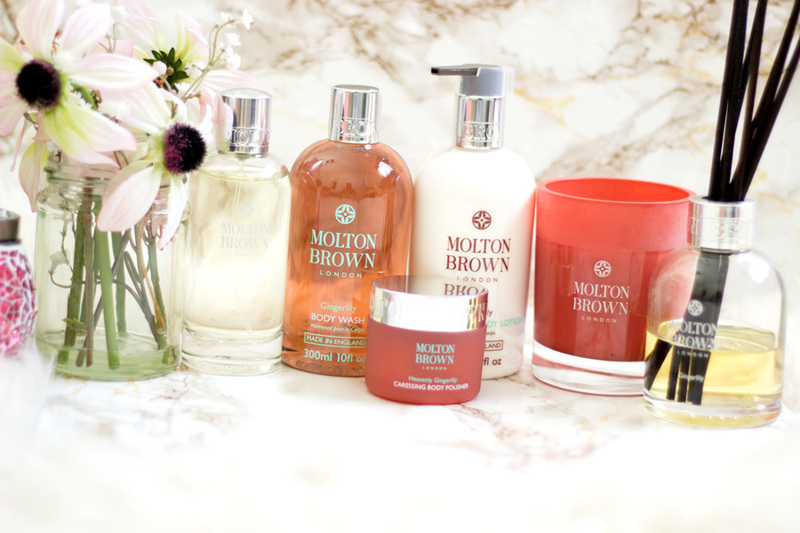 Anyway, Molton Brown was very successful as a hair salon and decided to branch out into skincare, body care, hair care, men's grooming products and fragrances. The rest is history. Of course, the brand has spread across the England shores and is now available in over 70 countries which is impressive. 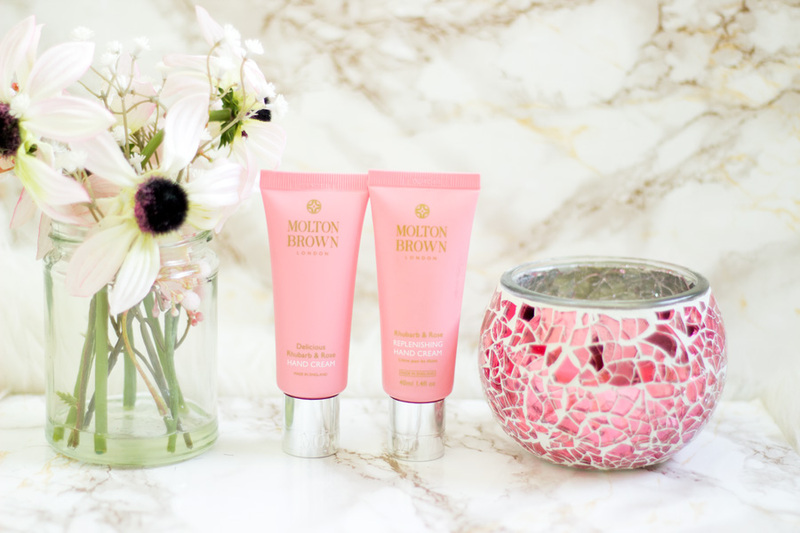 There is a high chance you would have come across Molton Brown products especially if you are frequent traveller because they have partnerships with some hotels. You can read more about the history of the brand over here. 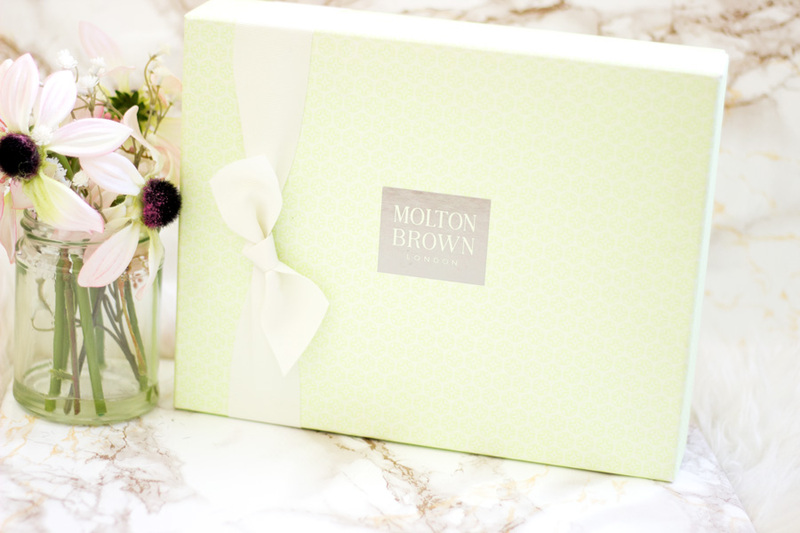 I know I always speak about the Molton Brown packaging each time I review them but I can't hep myself. Their packaging is just beautiful and I am happy that they make an effort both with the outer packaging and the inner packaging of the actual products. When they do their holiday sets, I just cannot handle how gorgeous their packaging is. They are the perfect gift for anyone because you don't need to do any extra wrapping. They look beautiful on their own and I have kept majority of their packaging because I am silly like that. They don't scrimp on quality at all when on it comes to their packaging and more importantly, the quality of the products. This was one of the first collections I tried back in 2015 and I fell instantly in love with it. As the name suggests, it is inspired by Yorkshire in England. The Delicious Rhubarb and Rose range is made from a blend of Rhubarb sourced from the popular West Yorkshire Rhubarb Triangle. The collection is blended with tantalizing, almost edible notes of zesty Yuzu fruit, Rose and Sweet vanilla. 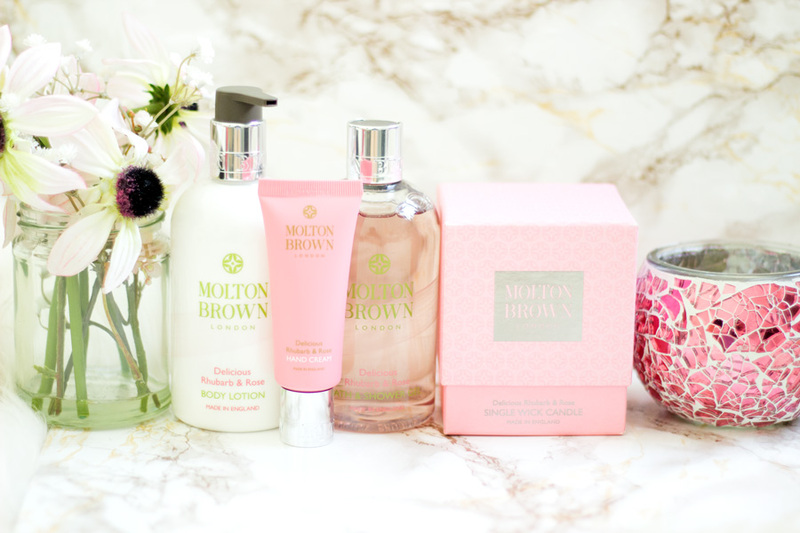 I was initially gifted with the Delicious Rhubarb and Rose Bath and Shower Gel and Body Lotion* and I was over the moon. I loved it so much that I repurchased the Bath and Shower Gel when I was running low because I just could not get over it. This is my second bottle and I see myself repurchasing it again when I run out. One thing I love about this collection is how it reminds me of Summer and I always reach for them during Spring/Summer months. I love that the range has a sweet fragrance but not an overpowering way. Another product from the range is the Rhubarb and Rose Replenishing Hand Cream* (I also have a back up) which is one of my favourite hand creams. It smells gorgeous and it keeps my hands soft and smooth without feeling greasy. The latest addition to my stash is the Delicious Rhubarb and Rose Collection Single Wick Candle*. 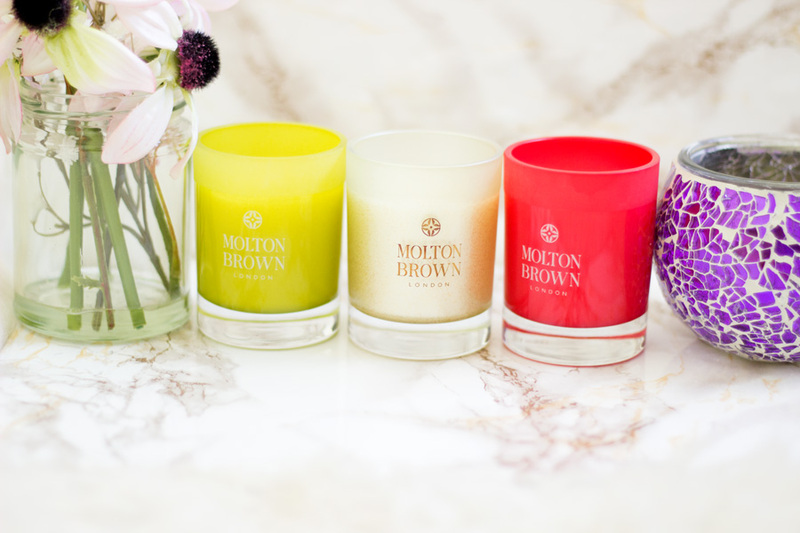 Molton Brown recently created a candle for this range and it is seriously the best thing ever!! It just totally completes the collection and I was so thrilled when this candle arrived my doorstep. It looks so delicate and feminine and it smells so beautiful. I have burned it more than a few times and it just puts me in such a good relaxing mood. Other products within the collection include the Fine Liquid Hand Wash, Hand Lotion, Three Wick Candle, Christmas Cracker and Christmas Bauble. 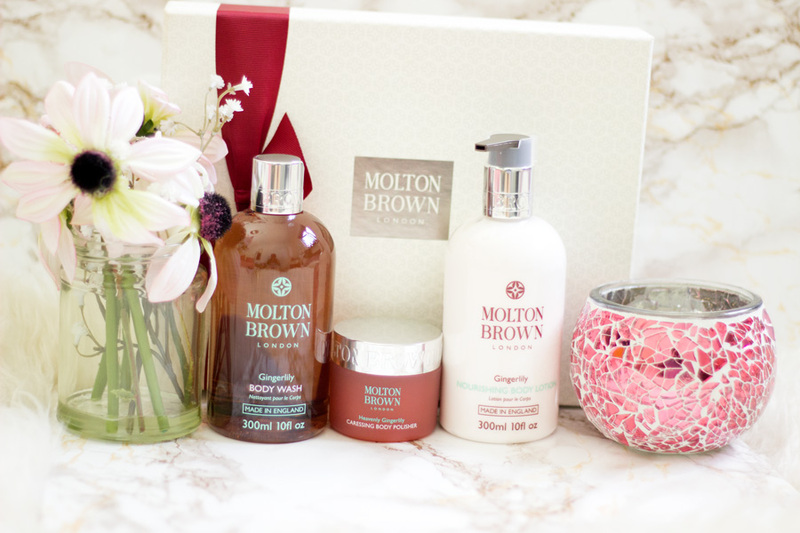 Molton Brown decided to give us a taste of exotic Tahiti without having to leave our bedrooms and they have achieved this through their Gingerlily Collection. According to their website, the ginger lily flower, known as ‘Tahitian flame’ inspired the collection colour, while the turquoise waters surrounding the heavenly destination are brought to life in the fresh water notes.The notes in this collection include Ginger, Lily, Tamanu Nut Oil, Cardamom and a host of others. 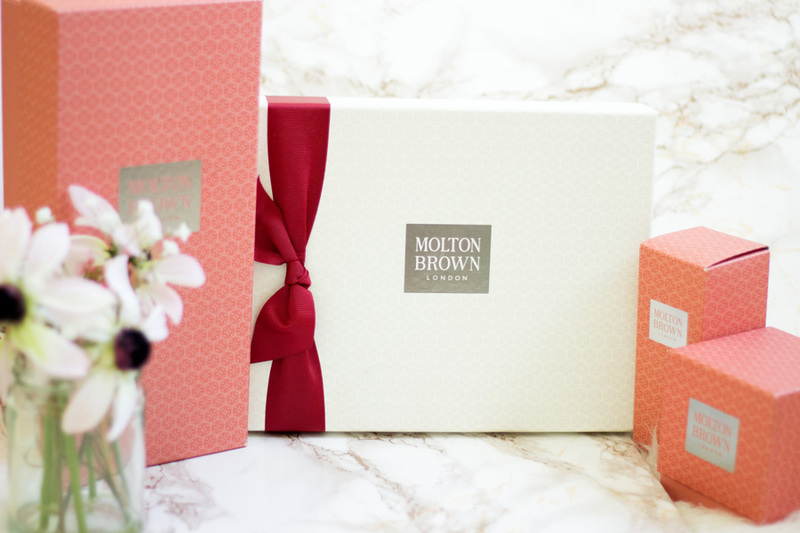 The Gingerlily collection is one of the best selling collection from Molton Brown and I am hardly surprised because it just smells so gorgeous. If you love exotic scents which just hit the right balance, you'd fall in love with this collection. 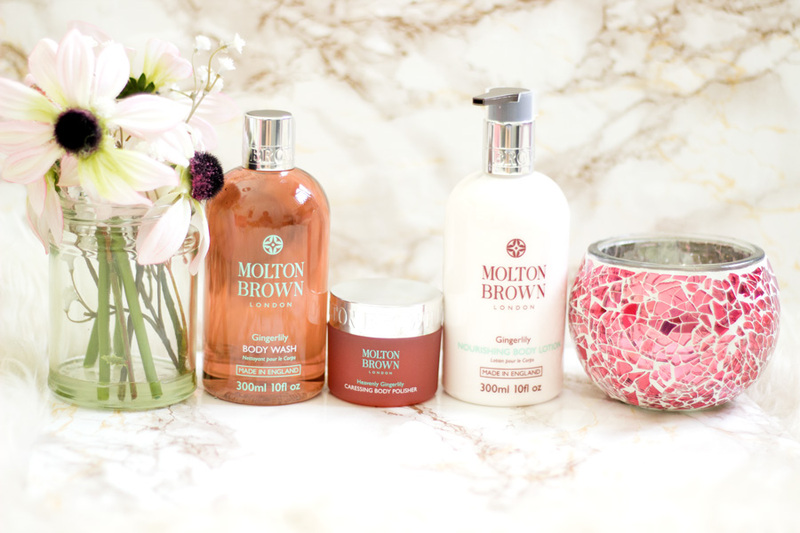 The Gingerlily Collection is my overall favourite from Molton Brown and I think I have the largest number of products from the collection among my stash. 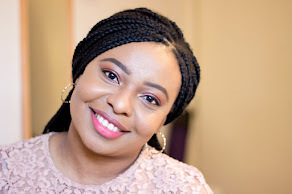 I fell in love with the collection when I was very kindly gifted the Heavenly Gingerlily Gift Set last Christmas. This set had the Bath and Shower Gel, Body Lotion and a mini Body Polisher. I think the Bath and Body Wash and Body Lotion lingers the longest on my body compared to the other collections I have tried. It's such a lovely fragrance and I love to use it all year round. 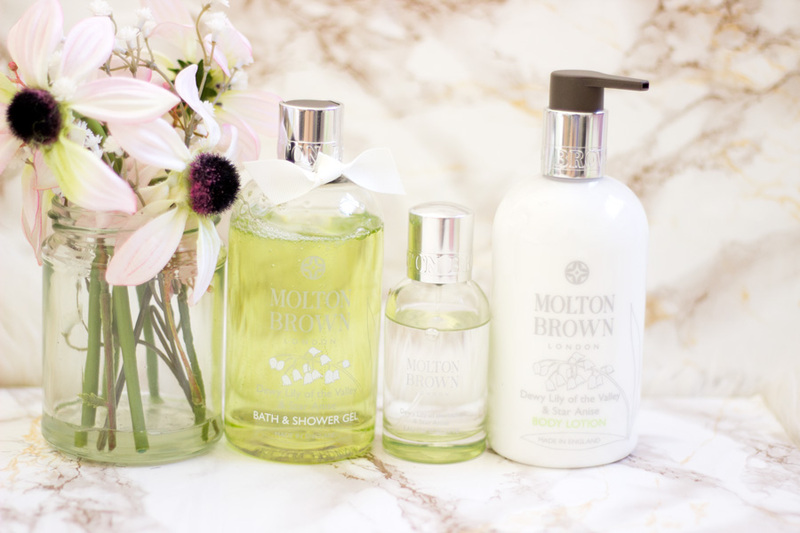 When I thought Molton Brown could not be more amazing with this collection, they launched the Gingerlily Home Fragrance Collection. I was like Yess!!! I was also kindly gifted the Gingerlily Home & Linen Mist*, the Aroma Reeds Diffuser* and the Single Wick Candle*. I have a full review of the collection here. I already had the candle from last year and it was on its last legs when the back up arrived. 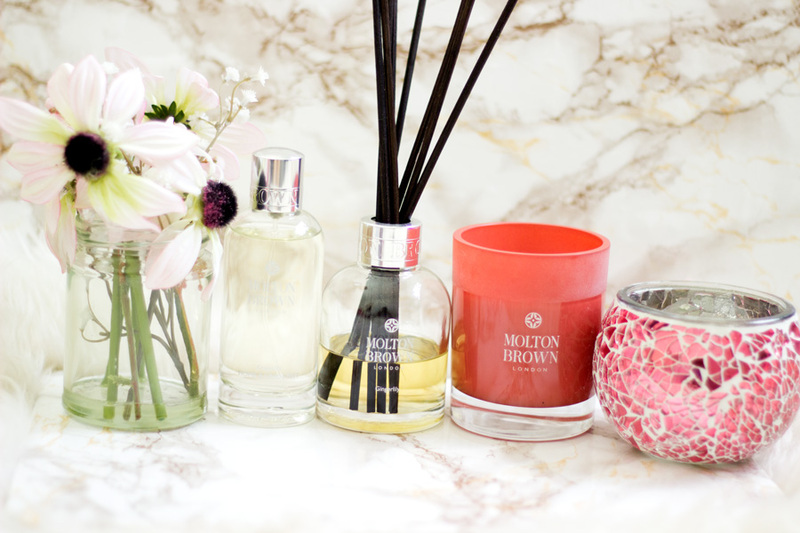 The Gingerlily Home Fragrance Collection is a firm favourite in my room and it has made my room much more welcoming than ever. Other products within the range include the Three Wick Candle, Hand Wash, Hand Lotion and Eau de Toilette. Now this isn't an entire collection in itself rather I think it just comes as a Hand Wash and Hand Lotion but it's special. 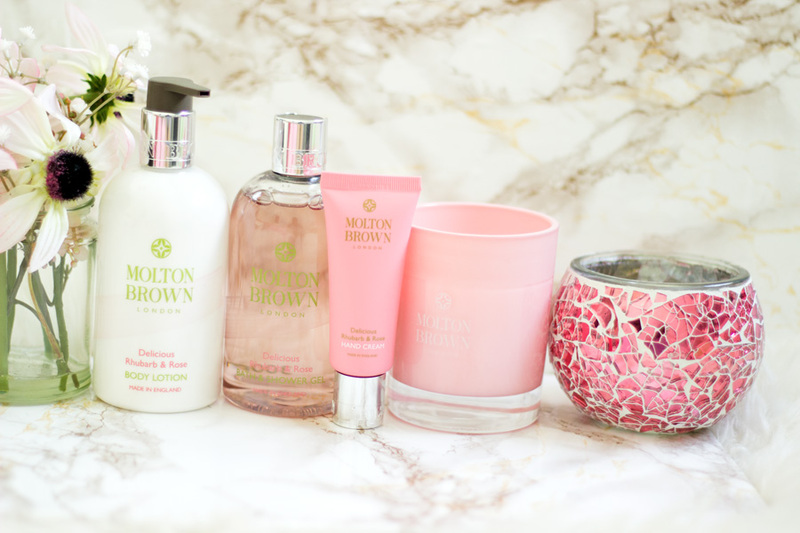 This was the first Molton Brown Hand Wash/Lotion Set I ever owned so naturally I fell hard in love with it. Just as the name suggests it is infused with Pomegranate and Ginger and other ingredients. 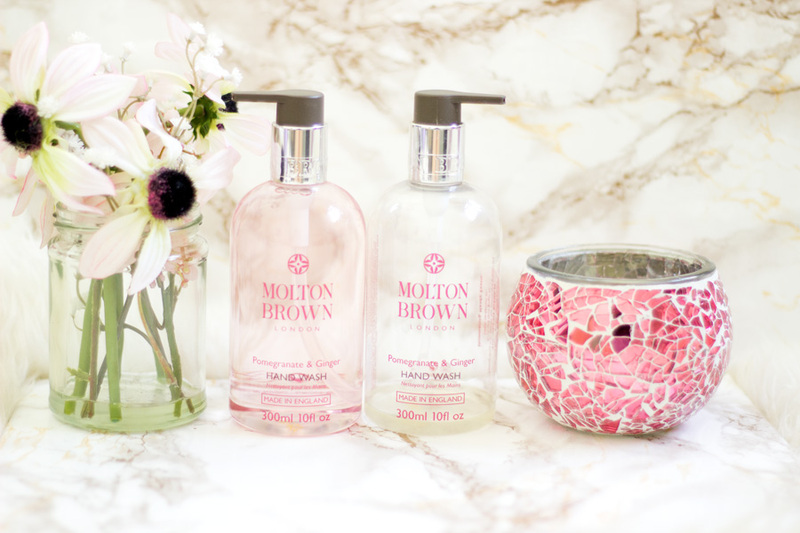 According to the Molton Brown website, the collection is a spicy, moisturising hand wash and lotion set blended with antioxidant-rich Pomegranate fruit extract and sweet cardamom oil. 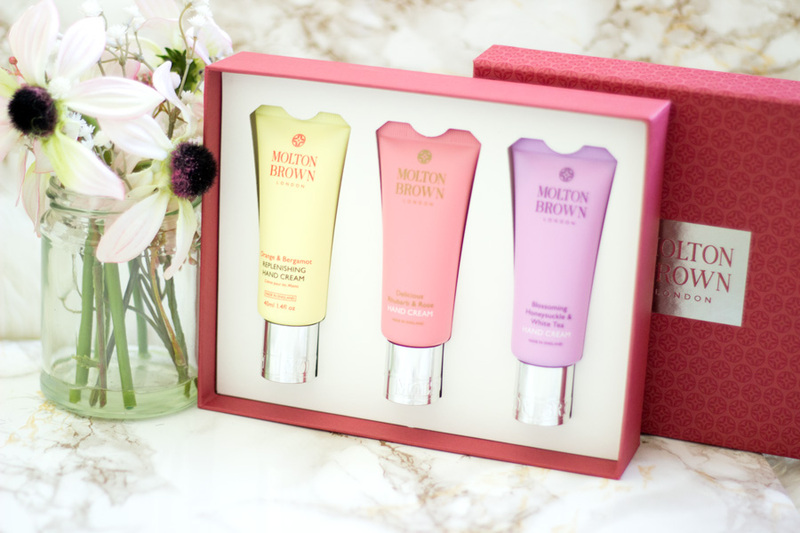 The notes in this set include the anti-oxidant pomegranate, spicy ginger oil, lily of the valley and vetiver. I actually had to repurchase the Hand Wash because I became a little bit obsessed with it. It just makes me want to wash my hands at the slightest excuse and I wish I could take the entire set with me everywhere I go. I just spied on the MB website that they make a mini version of this set which is so lovely. I am very, very tempted I have to admit. The good thing is it's not just a pretty hand wash and lotion, it actually does the job well and has anti-oxidant (from pomegranate) and anti-bacterial (from ginger) properties. This set will make an amazing house warming gift for anyone who's just moved into, rented or purchased a new home. I almost didn't want to include this collection because it was limited edition from last Christmas and was sold out even before it was Boxing day. However, it's one of the collections that makes me feel so pampered and it's so well loved that I could not resist sharing. I just checked online and realised that it is indeed back in stock which is shocking so if you wanted to try this range from last Christmas, this is the time. The Vintage 2016 with Elderflower Collection was designed with the festive season in mind and it captures the season in such a beautiful way. The notes within the range include Grapefruit, Vetiver, English Elderflower and Petit Grain. What's not to love? 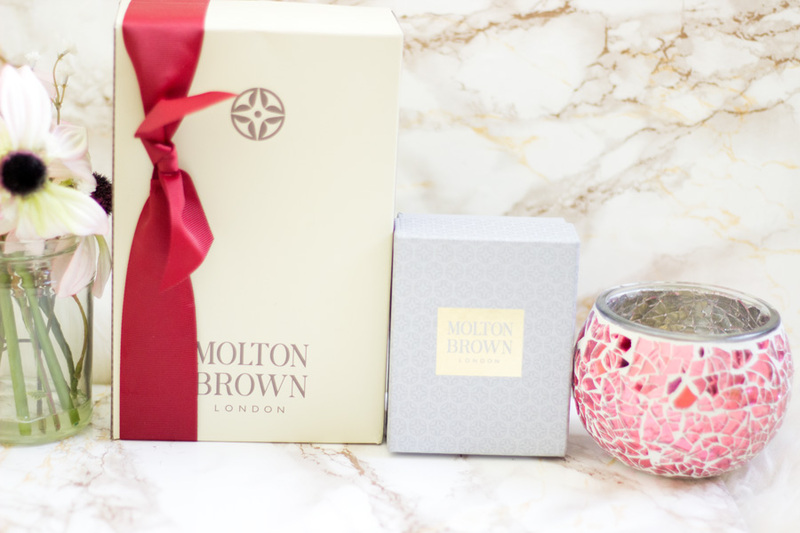 I have to say it is my favourite packaging from Molton Brown and I can't wait to see what the next limited edition festive range would look like. 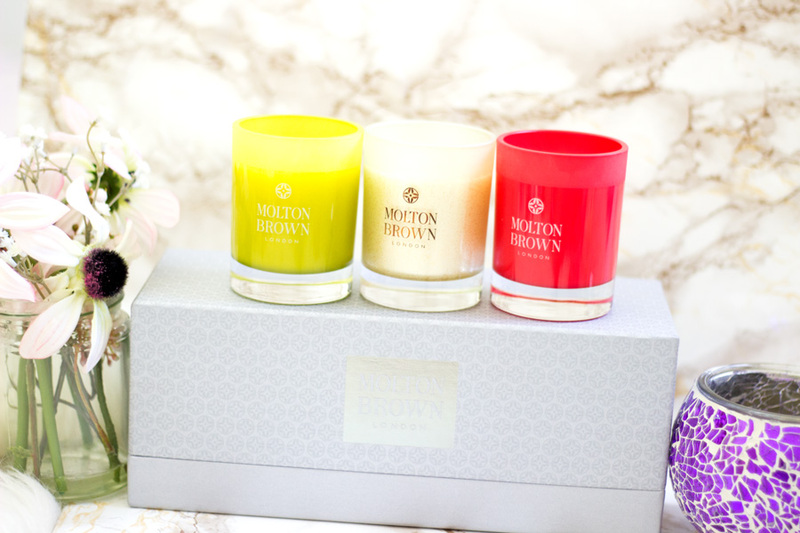 It comes in a regal gold colour complete with a signature Molton Brown bow.The collection consists of a Bath/Shower Gel, Body Lotion, Festive Bauble and a Candle. I was very kindly gifted the Festive Bauble with my blog's name inscribed on it and I have unashamedly not used it at all (it's just too cute). I purchased the Bath/Shower Gel and Body Lotion and they are for very special pamper days because I thought they'd never be back to purchase online. I got a mini candle from the festive range as well and it's seriously the cutest thing ever and I will be burning it now that the weather is colder. I just adore the entire collection and it's one that I know many people would love. The Dewy Lily of the Valley & Star Anise range was launched earlier this year just in time to usher in Spring and it totally captures the very essence of the season. I was very lucky to be invited to the launch earlier this year and I learned how to make a floral headband as well. The Lily of the Valley and Star Anise range is as British as it can get as the products used were sourced from Cornwall, England.The key ingredients in the Lily of the Valley and Star Anise range is, well you guessed it, Lily of the Valley and Star Anise.The Top note in the range is Magnolia, the heart note is Lily of the Valley and the base note is Ylang-Ylang. Of course, Star Anise is the extract used in this fragrance. 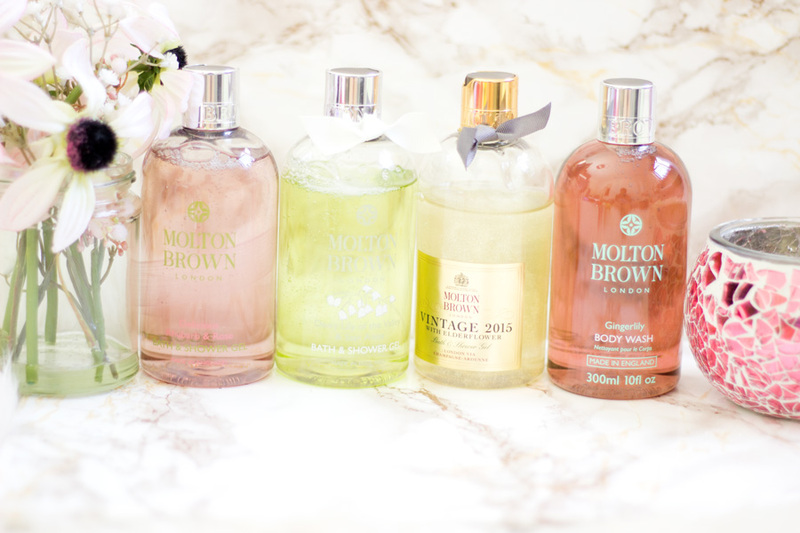 I was very excited with this collection because I got my very first Molton Brown Eau de Toilette* and the fragrance is perfect. If you love any of their collections, you'd absolutely adore the matching EDT (if there's one available). The EDT was my Spring/Summer fragrance and I still enjoy using it. 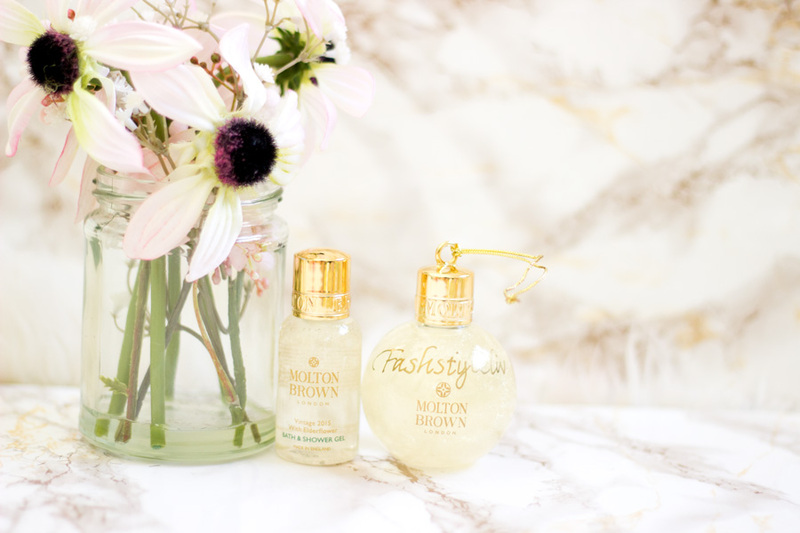 The Lily of the Valley & Star Anise Bath/Shower Gel* and Body Lotion* has such a feminine delicate fragrance which I know many brides will love or just anyone who loves feminine fragrances. The green packaging as well looks so fresh and it's one of my "pick me up" collections!! Other products within the collection include a Single Wick Candle, Three Wick Candle, Hand Cream, Aroma Reeds Diffuser, Hand Wash and Hand Lotion. Again forgive me for including a product that's not available anymore but I thought I needed to give them a shout. 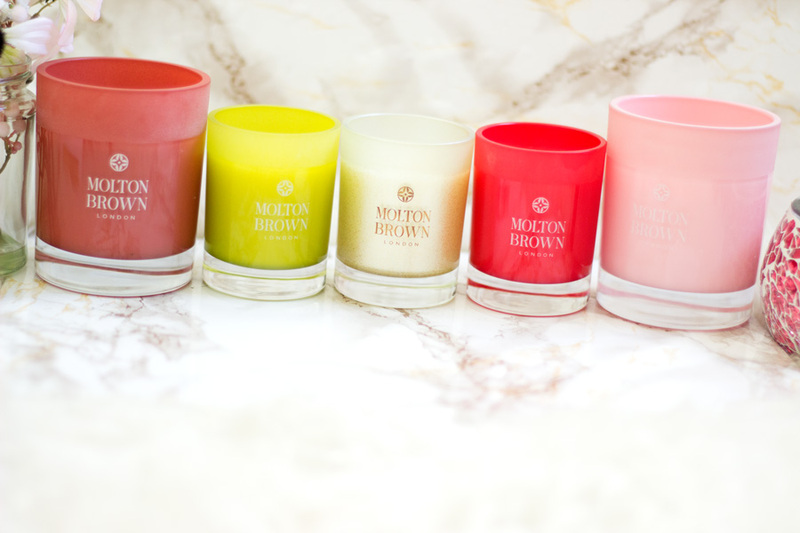 I got this from the Molton Brown Christmas Event I attended last year and I am still enamored with them. The collection consists of three mini candles in the some of the 2015 festive offerings including Festive Frankincense & Allspice, Vintage 2016 with Elderflower and Wondrous Myrrh, Musk & Cypress. The fragrances from these candles are so amazing that they seep through the packaging even before you get to open them. I know it's terrible but I have not burned them yet because I had so many candles this year including Molton Brown ones and I am saving them for AW. I have no doubts they will perform as well as the other MB ones. 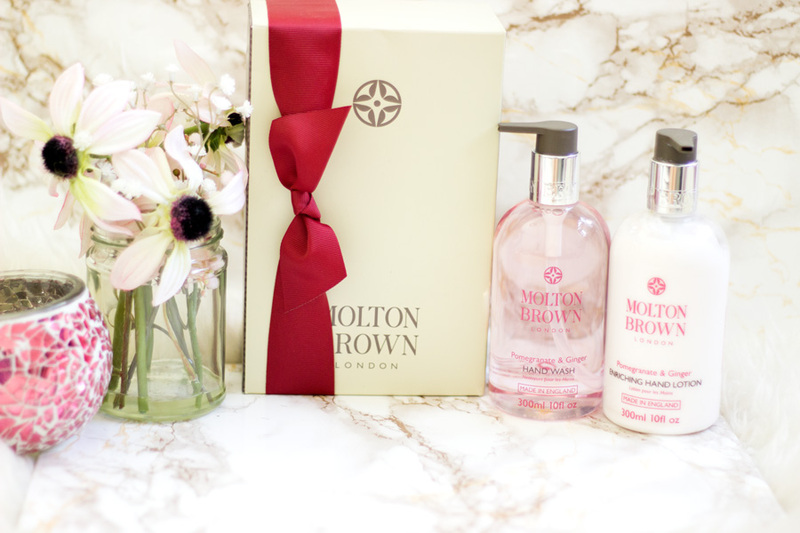 I love that there are quite a few places that you can get your Molton Brown fix from and the service they offer is really commendable. I have ordered online and asked for them to deliver to their stores which is such a lovely service they offer. I work full time so the chances of me being at home for a package to arrive especially on a weekday is almost non-existent. A collect in store service is really up my street. 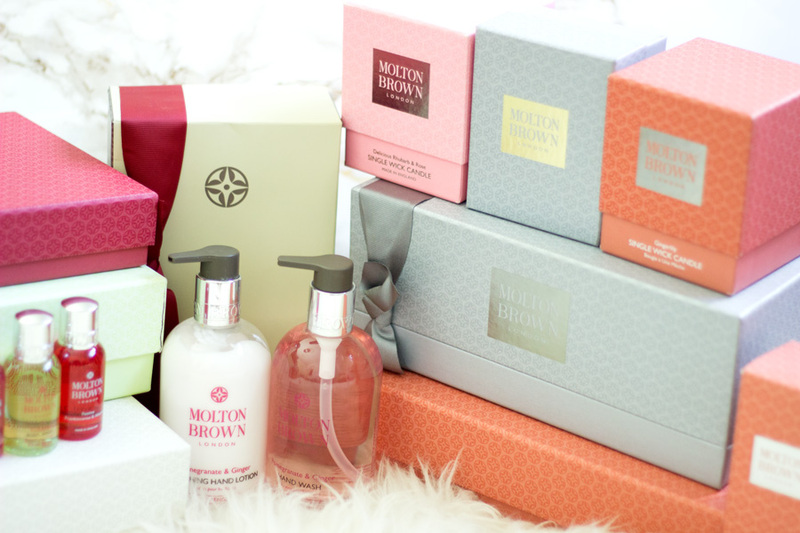 You can purchase directly from the Molton Brown website where you get a free sample (s) and free gift wrapping as well. If you register for their newsletter, you'd get access to their sales, offers and discount codes. 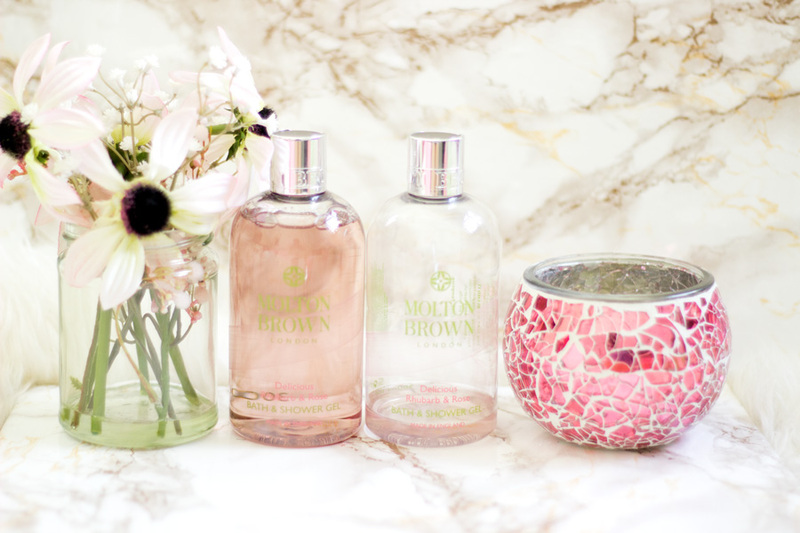 You can also purchase Molton Brown from other retailers including House of Fraser, Bentalls, Elys Wimbledon, Selfridges, John Lewis, etc. 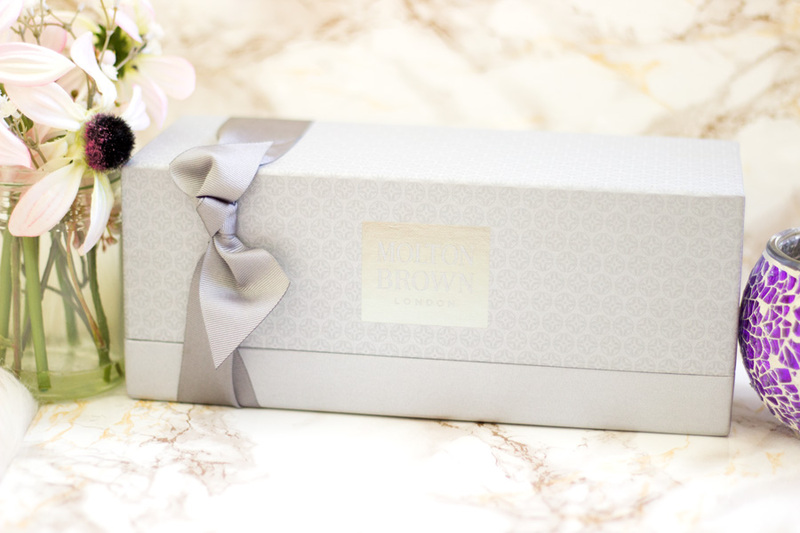 There you have it- my entire Molton Brown collection and I hope you found something you liked for yourself or perhaps a gift for someone. They also have a lovely Men's range which the Man loves a lot and I got him a few bits for his birthday earlier this year. He always uses my MB products every chance he has and believe me, he is very picky when it comes to body care so I know MB is pretty special. That's it from me today. 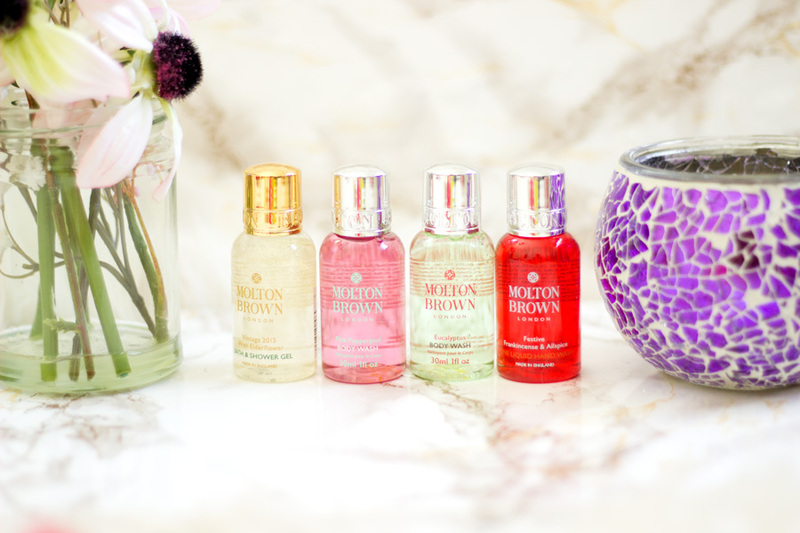 Have you tried any Molton Brown product? Great post Liv. I have tried their hand wash and hand lotion and I absolutely loved them. I think these area available in Debenhams as well. The packaging and quality of these are superb.